Ziamond Cubic Zirconia CZ Jewlers presents the Cleo Necklace. This necklace adds a regal look that is truly amazing with a 6 carat pear center cubic zirconia cz. An assortment of .75 carat each marquis and pear shapes are basket set in a beautiful arrangement with additional rounds that line the center. 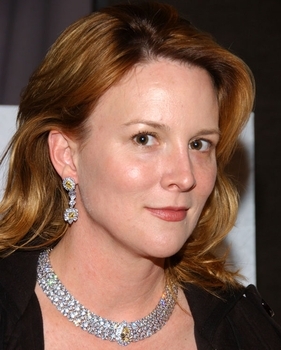 Laurel Holloman is also wearing the Nadia Drop Earrings that perfectly compliment the necklace. All Ziamond cubic zirconia cz jewelry is set in 14k gold, 18k gold or platinum.